When my wife, Adri, and I spent a few months traveling through Asia a couple of years back, we made a pact on the very first day we got there, and it was this: If we see smoke or steam coming out of a dark alleyway, we will investigate. That one simple rule served us well, sending us to everything from steamed buns to noodles and dumplings, but nowhere was it as useful as it was in the Singapore-Indonesia-Malaysia triangle, where satay delivers its smoke signals from nearly every alleyway you walk by. We all know what satay is, right? Little chunks of marinated meat threaded onto bamboo skewers, grilled over coals until charred, then served with a sweet-and-spicy peanut-based dipping sauce? You'll find it in Indonesian and Malaysian restaurants around the globe, or perhaps in the appetizer section of more cosmopolitan family restaurants and buffets. Heck, even Chipotle's Asian-themed chain, ShopHouse Kitchen, has a version on the menu. But all the Sizzling Satay With Extreme Peanut Dipping Sauce™ in the world can't prepare you for the depth, variety, and sheer volume of satay you'll find in its home countries. What we know in the States is really only the tiny tip of a vast iceberg of regional variations in both preparation and sauce. Satay sizzling over the coals at a stand in Singapore. In Sumatra, you'll find goat satay that's been braised before grilling, and in Melaka, bright-yellow satay made with chicken skin. In Bali, you'll get minced-pork satay flavored with coconut and chilies and grilled on lemongrass, and in Singapore, sweet and savory prawn satay with a mild, chunky peanut sauce. I've had a tough time locating definitive sources on the exact history of satay, but most seem to agree that Arab traders in the 15th century brought it to Southeast Asia, where the Indonesian island of Java became its regional epicenter. It shares its origins with kebab and shawarma, which in turn are related to all of the skewered meats in China and India, and indeed the entire diaspora of meat-on-a-stick from the Middle East. Nearly all satay is made with a similar technique: Tiny pieces of meat are slid onto small bamboo skewers, often with chunks of fat in between to help keep them moist during cooking. The meat is then marinated, whether that's in a sweet soy and peanut marinade, a coconut and lemongrass marinade, a dry spice rub, or a million variations in between. When a customer places an order,* the grill man grabs a handful of skewers and lines them up on a specially made grill that gets the meat to within inches of glowing-hot coals. * Some of the lesser satay spots may pre-grill their meat and reheat to order. You want to avoid this, as it invariably results in drier meat. A beef satay vendor in his custom boat-shaped satay cart in Jogjakarta, Indonesia. Normally, this is a bad idea: Dripping fat and juices catch on fire, flare up, and leave a sooty deposit on the meat. How do the vendors avoid this? By rapidly and continuously fanning the hot coals with a fan. More traditional spots will use a bamboo fan, though I've seen some enterprising satay cooks employing an electric fan. The fanning serves the dual purpose of not only keeping the flames away from the meat, but also helping the coals burn hotter, giving the satay a crisply charred exterior with no burnt or sooty flavors. As the satay grills, the cook may perform a number of secondary operations: Brushing with extra sauce or oil and sprinkling with a spice mixture are both common, though not required. After the meat is finished cooking, the sticks are gathered up and placed on a plate or in a paper cone and handed over, along with either a cup or a drizzle of sauce. At every stage in the process—selecting the meat, marinating, grilling, seasoning, and saucing—variation is possible. Attempting to taste, let alone catalog, all of the variations on satay is a near-impossible task. But that didn't stop us from trying. Adri and I stayed true to our word, following every smoke trail we came across until we'd found the source and ordered a couple of sticks for our mission. By the time we left the region a few weeks later, I'd made up my mind: I was going to re-create as many of my favorite versions as I possibly could. Pork satay in Bali—the only place where you'll find pork in mostly-Muslim Indonesia. First on the list: the delicious pork satay I'd had at a night market on the north shore of Bali. I was a little bit tipsy from a bottle of moonshine that some locals had offered me earlier in the evening, so that may have been clouding my judgment,** but it was the most delicious satay I'd ever had. It came with not one but two different sauces—a sweet and aromatic soy sauce that was brushed on the meat as it cooked and drizzled over it right after it came off the grill, and a peanut-based curry dipping sauce spooned on top—plus a flavorful marinade. The pork was deeply charred on the exterior, but not bitter, with a crisp crust giving way to a juicy center that melted on my tongue in the way that only well-rendered pork fat can. ** And perhaps my vision. Pro tip: Don't do what I did and accept local Balinese moonshine. It has a history of causing some potentially nasty side effects. Satay isn't health food, and fat is what keeps things juicy and lubricated, so for my satay, I'm using the fattiest cuts of pork I can find. I'm lucky enough to live near a Japanese market that sells Berkshire pork necks, a cut that is so rich with fat, it looks pale pink with a fatty filigree, like Kobe beef. I'm mostly telling you this to say ha ha, but don't despair! The pork shoulder you'll find at any supermarket will work perfectly well in its place. When cutting pieces of meat for satay, I use a three-step process. First, I cut the pork into thick steaks. Then I cut that steak into strips, and finally those strips into chunks. After cutting the steaks, it's important to cut your initial strips on a rather sharp bias. This allows you to produce strips of pork that, width for width, have much shorter lengths of tough muscle fiber, yielding a more tender result. This is especially important for tough cuts like shoulder or neck. With shoulder, you'll sometimes run into the issue of not being able to determine exactly which way the grain runs because there are a lot of crisscrossing muscle groups in there. The solution? Cut your strips on a bias, then cut those strips into chunks on a bias as well, which ensures that you shorten muscle fibers in two different dimensions. The other question on the meat is what size pieces to use. At some vendors and in some restaurants, you'll find satay as longer strips of meat that are threaded onto skewers individually. In other places, you'll find smaller chunks. After trying strips and chunks of varying thicknesses and lengths, I found that you get the best results with smaller chunks, threaded together as tightly as possible. This not only minimizes the length of the muscle fibers for more tenderness, but also decreases the surface-area-to-volume ratio of the skewers, preventing them from drying out before they char properly. The other reason to use chunks over slices is that it avoids that problem of pulling the entire piece of meat off the skewer when you're trying to get just a single bite. Next step, the marinade and sauces. I knew that I'd be making a marinade and two individual sauces, but those three elements also have many flavors in common, so I decided to streamline the whole process by making a single spice paste that I could use as a marinade and as the base flavor for the two sauces. For the paste, I started by pounding together lemongrass, garlic, shallots, coriander, white pepper, and sugar with a mortar and pestle, along with a big pinch of salt to act both as seasoning and as an abrasive to help break down the aromatics. Initially, I was using a bit of ginger in there as well, but fresh turmeric is better. Like ginger, it's a rhizome, but it has a much milder, earthier flavor than ginger, which tends to be hot. Speaking of heat, I also added a few dried chilies. Pasilla chilies are not an authentic Indonesian ingredient, but they're widely available here and work well as a substitute for dried Asian chilies. As we've found multiple times in the past, using a mortar and pestle to crush tough plant cells draws out much more flavor than chopping them in a food processor can. It is, however, significantly more work. This is an easy problem to solve if you have a spouse, or perhaps a niece or nephew whom you want to keep occupied for a good 20 to 30 minutes, but if you're the one doing all the work, it's a little more troublesome. 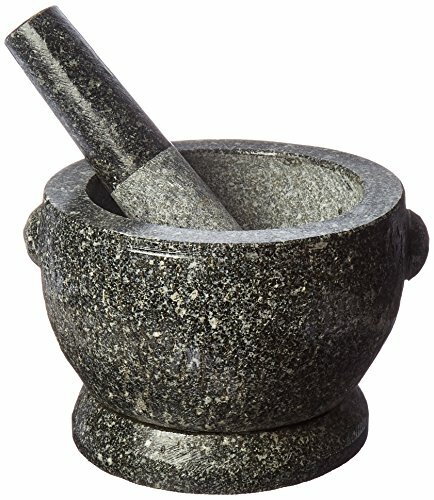 A good technique I've been using recently is to tag-team the spice paste with the mortar and pestle and the food processor. Start the aromatics out in the mortar and pestle to get them pounded into a rough paste and draw some great flavor out of those plant cells, then transfer the mixture to a food processor to reduce it to a fine paste. Once I had the spice paste completed, I tossed one-third of it with the pork pieces to coat them, then turned my attention to the first of the two sauces. To make the peanut sauce, I pounded roasted peanuts with the mortar and pestle while I fried up another third of the spice paste in a skillet. Frying the spices for the sauce concentrated their flavors and also triggered the creation of many new flavor compounds, which gave the sauce a different sort of complexity from what I'd be getting from the charred spices of the marinade, or the simmered-spice flavor I'd be introducing to the second sauce. Once the curry paste had bloomed, I thinned it out with a combination of tamarind juice concentrate (for sourness), fish sauce or soy sauce (for umami depth), a little bit of extra oil, and some water, letting it all simmer together until it achieved a creamy consistency. It's best to use real tamarind pulp, soaked in hot water and squeezed to get the concentrate, but jarred tamarind concentrate will do in a pinch. There's so much other stuff going on in this dish that you won't notice much difference. The second sauce I made was a seasoned sweet soy glaze based on kecap manis, a thick and syrupy Indonesian sweet soy sauce. I combined the kecap manis with garlic, ginger, and a little sugar, then simmered it to infuse the soy sauce with flavor. To finish it off, I stirred in the remaining third of my spice paste and simmered it just a bit longer. With my two sauces made and my meat marinated, it was time to skewer and grill. If you've ever tried skewering small, fatty, slippery pieces of meat, you know that it can be tough going. I can tell you from experience that you definitely don't want to accidentally skewer a finger when it's coated in a spicy marinade and raw meat juices. 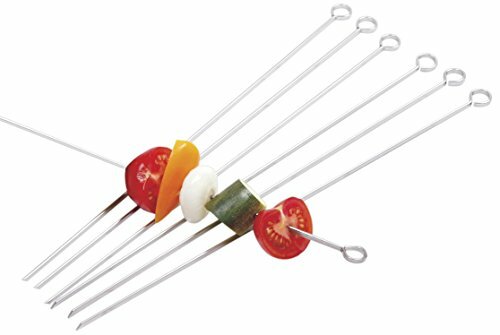 Using good, sharp skewers is a first step in accident prevention (check out our full review of skewers here). The big trick is to use something as a backing aside from your finger. I happened to have half an onion kicking around when I was skewering the meat in this photo, so that's what I used. You could just as easily use half a potato, half an apple, half a lemon; whatever is most convenient and cost-effective. Note that you'll have to either cook or discard whatever you use (nobody wants to eat a pork-stained apple). By the way, this photo and the one following were both taken from an earlier version of the recipe, so the color of the marinade is not reflective of the finished dish! Whatever heat source you use, you'll need one other tool: a fanning device. That fanning device can be anything from an actual handheld fan to a stiff piece of cardboard to a Shop-Vac set on blow. So long as it can get lots of air moving, it'll do. I used a cardboard box top for mine. As soon as I placed the skewers over the hot coals, they started to drip rendering pork fat, causing flare-ups. But, taking my lead from the cooks in Indonesia, I was ready with that stiff piece of cardboard to start fanning. Once the pork was cooked through and crisp around the edges, I moved it over to the cooler side of the grill so that I could brush it with sauce without worrying about flare-ups, then shifted it back over direct heat just until the sauce reduced down to a sticky glaze that coated the meat. It took only about 45 seconds. Served with another big drizzle of the glaze and a few dollops of the peanut sauce, it was every bit as crisp, smoky, juicy, and delicious as those skewers I'd had in Bali.